senseFly develops, assembles and markets autonomous mini-drones and related software solutions that have already proven themselves in the mining industry. Our eBee product solution is one of the easiest to use and safest drone systems available worldwide. Being one of the lightest drones in the industry, weighing less than 700g (1.5lb), you can rest assured of safety onsite while still completing projects fast and efficiently. Use our system to take aerial imagery of your site, any time, without complex infrastructure or long and complex preparation times. Our drone is a turnkey solution and includes all the accessories required for operation, as well as our control and monitoring software eMotion 2 and our image processing software Postflight Terra 3D-EB. Thanks to our integrated autopilot no piloting skills are required to fly the eBee. Our intuitive ground control software eMotion 2 allows you to plan, simulate, monitor and control your flight. The eBee is hand-launched and lands autonomously in either a circular or linear landing method depending on available space. With eBee you can take your own aerial imagery, and produce 3D models down to 5cm of precision. Safety on mine sites is always a high priority and we take this very seriously. Our eBee drone has many safety and failsafe protocols built into it, such as strong wind warning, low battery, buffer zone restrictions and many others. In all these circumstances the system will notify the user and auto-respond according to the problem. The eBee drone has 45 minutes of flight time covering a maximum of 10km2 (1,000ha) and can handle wind speeds up to 45km/hr (28mph). Once the drone has landed you can immediately process the imagery onsite with our professional photogrammetry software Postflight Terra 3D-EB. This allows you to produce precise orthomosaics and 3D models for your project requirements, whether it is for spoil heap calculations, pre-project documentation, progress reports, imagery overlays or any uses. The key here is speed, efficiency and safety, which we make sure we complete effectively to get your project running as smooth as possible. senseFly is a Swiss company that develops and produces autonomous ultra-light flying drones (also called UAVs) and related software solutions. The technology behind senseFly’s solution first emerged in 2001, when a team of robotic researchers at EPFL (Lausanne, Switzerland) began investigating the control and navigation strategies of flying insects. This pioneering research enabled the development of a highly integrated autopilot employing smart control strategies similar to those found in flies and bees. senseFly was founded in late-2009 and launched its first commercial product shortly after. In 2012, senseFly joined the Parrot Group and since then more than ever has pioneered the field of flying drones for mapping and GIS applications. If you have an enquiry or if you want more information, do not hesitate to contact us directly or through the form below. New Always On service package ensures business continuity for eBee Plus drone owners via 48-hour drone replacement, extended warranties and free maintenance checks. Using drones to boost safety and survey efficiency. The eBee Plus is a large coverage photogrammetric mapping drone featuring RTK/PPK upgradeability for survey-grade accuracy on demand. albris is a sensor-rich mapping and inspection drone with the widest camera breadth of any civilian platform. eBee is a fully autonomous fixed-wing drone used to capture high-resolution aerial photos that can be turned into accurate orthomosaics and 3D models. 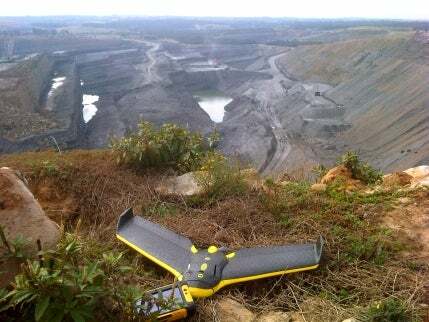 senseFly’s Mine & Quarry 360 is a complete aerial site analysis system. The accurate and timely geospatial data the eBee Plus collects, combined with Airware’s powerful platform and industry-focused analytics, creates a unique decision-making tool. Now available in Canada, senseFly’s new Always On service package ensures business continuity for eBee Plus drone owners via 48-hour drone replacement, extended warranties and free maintenance checks. Canadian eBee Plus, eBee SQ and albris drone users are now significantly closer to achieving ‘Compliant Operator’ status. Today’s new combined hardware/software release makes assessing linear assets with UAS easier and less data-intensive than ever before. New partnership delivers robust airspace intelligence and unmanned traffic management solutions to senseFly’s largely autonomous commercial drones. Airware to leverage senseFly’s eBee Plus fixed-wing drone as part of large-area data collection and analysis solutions.